Cleaning your windows is one of the most tedious tasks you will face, but it is definitely worth doing. In addition to being a hazard, the effect of dirty glass can quickly ruin the appearance of your perfectly polished and waxed automobile. After you have completed all other detailing tasks, put the perfect touch on your car by detailing your car's glass. Just as in the selection of car shampoo and car wax, no two car enthusiasts can agree on the ultimate auto glass cleaner for their car. Some people like ammonia cleaners, while the purists will use nothing but clear water. Whatever you use, the principles are the same: clean, dry and polish. I highly discourage the use of ammonia-based glass cleaners on your car. While ammonia is a great glass cleaner for the home, ammonia is harmful to many car surfaces, including vinyl, rubber and leather. More importantly, the use of ammonia inside your car is harmful to your health. Use an automotive glass cleaner that specifically states it's safe to use on window-tint film. A glass cleaner that's safe for window-tint film will not harm the plastic and vinyl surfaces on your car. The grime on this Honda S2000's glass was so bad the wipers and washers would not cut through it. This is a dangerous situation for the driver. A Pinnacle GlassWork Windshield Washer Booster was added to the owner's wash reservoir as a booster. A proper cleaning solution in your windshield washer is necessary for safe driving. Start your car window cleaning with the driver's door and front passenger's door. If your door has a window frame, lower the window approximately 1 inch to allow access to the top part of the glass. This part should be cleaned and dried first. Spray with quality glass cleaner and buff dry. Now roll the window back up, and clean the remainder of the window. Pay attention to the corners of the windows, as this is where you will get most smears and streaks. Don't forget your driver's side and passenger's side mirrors. 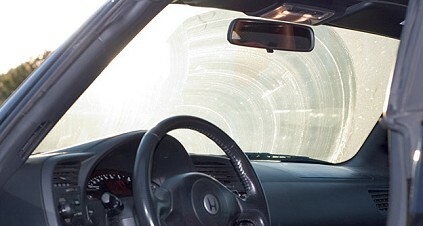 While you're sitting down in the passenger's seat, clean the inside of the windshield. It is easier to clean from the passenger's side, as your access is not obstructed by the steering wheel. Take your time around the rearview mirror, as it is only glued to your windshield. If you bump into the rearview mirror hard enough or at the right angle, you can break it loose from the glass. The inside of the rear window is the most difficult to reach and should be done last. The best technique for cleaning your rear window is to use the back side of your hand to guide your towel down into the corners. Trying to use the palm of your hand will force you to be a contortionist and you will draw strange looks from your neighbors. While microfiber glass towels work great, you can go crazy trying to keep the different towels and their purposes straight. You can end up with dark blue, light blue, green, orange and pink towels, which can get nuts! The waffle weave glass towels are the best general-purpose towels, and they work great on glass and clear plastic. If you're looking for a specific glass microfiber towel, generally the towels with a deep, plush nap do not work well on glass. The best microfiber towels for glass have a low pile and a tight weave. The tight weave gives them a little more scrubbing power. Be cautious of cheap microfiber towels. There's a good chance that any microfiber towel you purchase in bulk through a retail chain will leave lint on your glass. Fiber shedding is a significant problem with bulk towels, because most of these products are created for janitorial services. The windshield is one of the most overlooked surface on most cars. At best, you wash it when you wash the car and spray it with a few shots of glass cleaner when you can no longer see through the haze. Did you ever think of polishing your glass? Normal driving will coat your windshield with a variety of contaminants that normal glass cleaners cannot remove. Plus, your windshield has the greatest vertical forward exposure, which means it gets pelted with road stones and other debris. It's a wonder that windshields hold up as well as they do. Automotive glass polishes that remove minor water spots and road contamination have been around for quite a while (although they are not always easy to find). I highly recommend using a glass-polishing product like McKee's 37 High Performance Glass Restorer to keep glass clean and free of water spots. It�s simple to do. Just rub the polish in thoroughly with a foam applicator, and buff dry with a microfiber towel. If you have severe water spotting, you can use CarPro Ceriglass Glass Polish with a Carpro Rayon glass polishing pad (use on exterior only!) for a bit more cutting power for the really tough jobs. Please be aware that a glass polish cannot fix glass damage from road stones and severe water spot etching. If your glass is badly pitted or etched, it may need to be replaced. Windshield wipers are essential for cleaning your windshield and rear window in rain or snow, or when your windows become bug-ridden or dirty from long road trips. Wipers perform best when the rubber is in good shape and the glass is fairly clean. You should make it a habit to clean your front and rear wiper blades at the same time you clean your glass. After cleaning your glass, use a damp cloth to wipe the rubber blades, removing bug residue, wax and other dirt buildup. Although rubber dressing helps preserve, protect and beautify the rubber and vinyl parts on your car, you should not use dressings on your wiper blades. Rubber dressing on your blades will cause streaking and smearing, impairing your vision. The best overall maintenance of your blades is keeping them clean. If you want to protect your blades, use a product like 303 Aerospace Protectant. If you have expensive after-market blades, 303 Aerospace Protectant will make them last twice as long. A good wash fluid is just as important as your wiper blades. Pick a wash fluid with enough power to cut the grime, but don't use something so harsh that it stains your car. I was using a popular orange wash booster, but it created these horrible white stains around my windshield. I finally switched to 303 Instant Windshield Washer Tablets, which performs flawlessly for me in all conditions. If your car is a year or more old, a close inspection may reveal dirt buildup in the corners of your windshield and rear window around the trim. To remove this caked-on gunk, use an old toothbrush or detailing brush with your spray cleaner. Before cleaning, lay a towel at the base of the window to catch drips. Spray your brush with window cleaner and shake off the excess cleaner. Use your brush to scrub along the trim, breaking loose the dirt. Use the tip of a cotton swab to reach underneath trim and remove trapped dirt. If your brush won't remove the buildup of dirt, use a sharp single-edged razor blade to gently remove the dirt from your glass. Take care not to push your razor blade too far under rubber seals, as this may cause leaks. On the rear window, stay clear of defroster strips that are not embedded in the glass. Cutting the defroster strips will render them useless. Follow up after the razor blade with your brush and glass cleaner. Tinted window film is often applied to the inside of windows to shade passengers or provide privacy. 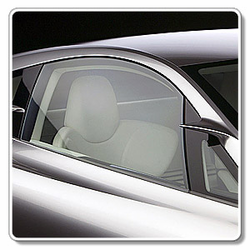 Tinted window film is a thin sheet of Mylar plastic. Mylar scratches easily and will be destroyed by ammonia. To clean tinted windows, use water or a mild cleaner such as McKee's 37 Krystal Vision Glass Cleaner. Tinted window film that has been scratched can be polished with cleaners designed for the vinyl windows often found on convertible tops. The product I recommend for polishing and regular maintenance of tinted window film is McKee's 37 Plex All. Plex All comes in an aerosol spray can and is safe for use on plastic, Plexiglas and tinted window film. In addition to polishing your tinted window film, Plex All works great on your taillight and headlight covers. Maintaining clear plastics and window tinting is tricky. These materials will scratch easily and lose their original clarity. I highly recommend the use of McKee's 37 Plex-All on plastic. Use McKee's 37 Plex-All on window tinting, convertible rear windows, headlight lenses, instrument panel lenses and other clear plastic surfaces. To use McKee's 37 Plex-All, simply spray and wipe. That's it! There's no buffing, no mess and no waste. The headlight lenses on most new cars are plastic. If you don't polish the lenses every few months, they will yellow and haze. McKee's 37 Plex-All is a great product to use for regular cleaning and polishing. The days of the glass headlight are long gone. 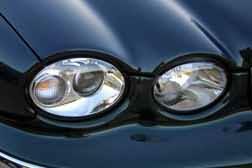 Most vehicles made since 1990 have plastic lenses covering the headlights. These lenses protect expensive lamps from flying stones and road debris, but over time they discolor and become chipped from road stones. Without proper care, plastic headlight lenses will degrade until they turn opaque, which severely restricts the amount of light reaching the road. Most of the damage is caused by exposure to ultraviolet (UV) light. If you live in a southern state, headlight lens discoloration will become noticeable in as little as 2 or 3 years. To maintain your plastic headlight lenses and taillights, I recommend regular use of McKee's 37 Plex-All. It is a combination cleaner, polish and protectant. When used regularly, McKee's 37 Plex-All will protect plastic lenses and windows from UV damage. McKee's 37 Plex-All will not repair damaged or scratched plastic. For this you will need a plastic safe abrasive polish, such as Meguiar's Mirror Glaze #17 Plastic Cleaner or Meguiar's Mirror Glaze #10 Plastic Polish. Use Meguiar's #17 Plastic Cleaner to remove heavy clouding and surfaces scratches. Use Meguiar's Mirror Glaze #10 Plastic Polish to maintain as-new gloss and appearance. Annual polishing with a polish will restore the transparency of plastic windows and headlight lenses. Few people enjoy cleaning car windows. If you find the right tools and cleaners, this chore will be much easier. Some people hate doing the interior windows so much that they rotate which windows they clean each time they wash, such as one week cleaning the windshield, and the next week, the side windows. With the advent of microfiber towels, window cleaning has become much easier.